Down in the Northern village of Nettlebridge, Harry (Harry Worth) is the conductor of the local brass band where he has to contend with his aging bandmates' rheumatism and the authoritative demands of the tea-ladies who man the village hall. A more pressing concern, however, is the proposed building of a local airport which threatens to change the face of Nettlebridge. Mounting a campaign to save Nettlebridge, Harry and his ensemble form the Anti Airport Committee in order to put a stop the building of the airport. 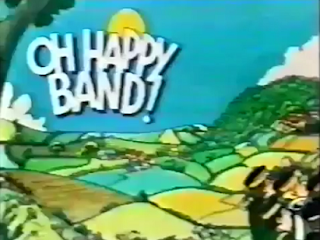 Jeremy Lloyd and David Croft certainly know a thing or two about writing sitcoms, so it should come as no surprise that Oh Happy Band! is packed full of fantastic dialogue and recognisable characters. There's a Dad's Army vibe about the series what with it featuring an aging band of muddlesome chaps taking on the enemy, but it never really clicks as the characters aren't quite strong enough. However, whilst it's not an amazing sitcom there are plenty of laughs and it's a decent enough watch for the sitcom connoisseur. Six 30-minute episodes of Oh Happy Band! were written by Lloyd and Croft with the episodes being transmitted on BBC2 at 8.30pm on Wednesdays. Croft also found himself backing up his writing credit by sitting in the director's chair for the series. The musical sections were provided by the Aldershot Brass Ensemble. Lester Small (Brian Murphy) runs a driving school in a small West Country town and, unfortunately for said town and its residents, he's as accident prone as his learner drivers. Perpetually plagued by the inability of his student Mrs Davies (Hilda Braid) who is involved in at least two explosions whilst driving with Lester, teaching three point turns isn't straightforward for Lester. Luckily, Mr Davies (Richard Vernon) is the local bank manager and is more than happy to continue bankrolling Lester's business. The reasons for this are twofold: it not only saves Mr Davies the hassle of teaching his wife to drive, but Lester's disastrous antics also keep local businesses such as panel beaters and 'get well soon' card manufacturers afloat. At home, meanwhile, Lester has to contend with the seemingly constant presence of milkman Bert (Colin Spaull) who is frequently popping round to visit Lester's wife Sally (Amanda Barrie). 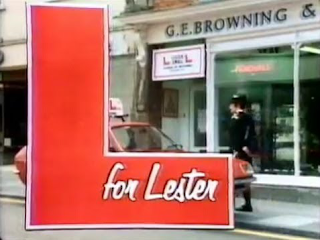 L for Lester is far from memorable, but it's an amiable enough sitcom and Brian Murphy (who is essentially playing Brian Murphy) brings a touch of comic class to the proceedings. The narratives contained within are standard sitcom fare with a bit of farce thrown in to boot, but the laughs are perhaps a little too gentle and can often be seen coming a mile off. Still, it's worth watching a couple of episodes if you're looking for a no-hassle trad-sitcom. The series was written by Dudley Long and consisted of six 30-minute episodes which went out on BBC2 in a 9pm timeslot. Jude (Rachel Weaver) and Mo (Amanda Symonds) live in the grimy surroundings of 76 Riverside Terrace, a poky high rise flat with expansive views of London. And, for these two twenty-something girls, life is never easy. Clad in a never ending procession of outfits which seem to swing wildly between punk and new romantic, Jude is a thorn in the side of the DHSS and permanently unemployed. Constantly being dragged into Jude's schemes is the more conservatively dressed Mo. Starting off in the employment of Seymours Ocular Aids, Mo soon finds herself queuing up at the DHSS as she struggles to either receive her giro or find gainful employment. Life is never easy for the characters with the launderette owned by Mo's mother May (Maria Charles) seeming to come off worst, six of her washing machines are stolen in one episode while Mo and Jude taking temporary charge in another episode and run it into the ground. Away from the launderette, their fortunes don’t fare much better with Jude’s ridiculous scheme to convince the DHSS that she’s pregnant being a case in point. There’s also time for relationships, but again, the girls stumble here with Jude dating a complete drip and Mo finding out that her man is seeing their gay neighbour Richard (Ray Burdis) on the side. The epitome of early Channel 4 programming, Dream Stuffing takes a wry look at life in the seemingly endless dole queue of Thatcher's Britain and boasts some fine comic performances. The scripts, however, are a mixed bag and often fizzle out due to their slow narratives. Dream Stuffing only aired for one series, but managed to put in an extended run of 10 episodes which went out at 9pm on Friday evenings on Channel 4. 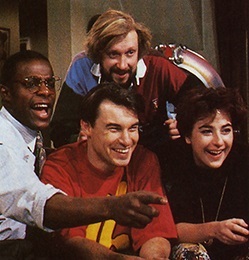 Hammering out the scripts for Dream Stuffing were Paul Hines and Su Wilkins while their words were brought to life by director John Kaye Cooper. Kirsty McColl provided the theme tune. Tim (Mark Williams) has a number of problems with the busy flat that he lives in. The first is an invasion of ants that he seems unable to stem, no matter how many of the little buggers he flattens with a mallet. Secondly, he shares his flat with a disparate bunch of individuals. Lou (Lou Curram) has a little black book full of an endless stream of men's numbers that runs concurrently with an equally long list of failed relationships. Nick (Jesse Birdsall) is a childlike adult with a penchant for the flashy lights of video games and a fashion sense which is equally garish. Compton (Paterson Joseph), meanwhile, markets himself as a hard working professional, but easily falls under the spell of Nick's video games within seconds. Flat share comedies were rather ubiquitous in the 1990s and, compared to series such as Game On and Men Behaving Badly, it's not unfair to say that Dead at 30 fails to match these. However, whilst the characters in Dead at 30 feel a little loose and caricatured, it's only a pilot episode and, given the writers involved, you do begin to wonder if it could have blossomed into something a little more special. 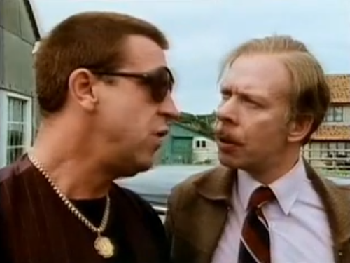 Those writers, of course, were the comedy geniuses known as Paul Whitehouse and Charlie Higson. 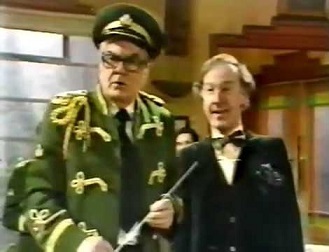 Within two years, The Fast Show would land and become one of the major comedies of the 1990s, so Whitehouse and Higson didn't do too bad. Dead at 30 was part of the Bunch of Five comedy pilot series which also included pilots for Frank Skinner's Blue Heaven and Vic and Bob's The Weekenders. That's it for the first edition of British TV Comedies You Can't Remember, but, as ever, your suggestions for future inclusions are more than welcome. And, if you think the shows featured above should be even more highly regarded then let me know in the comments below! Yey for Dream Stuffing! I'm forever in your debt regarding that. Lou Curram, aka Lou Gish, taken far too soon from us at the age of 38 from cancer, the same disease that had taken her mother Sheila less than a year earlier. Her dad was Roland Curram, still best known for the flamboyant Freddie, the resident gay expat in doomed soap Eldorado. An actor who didn't come out until the early 90s, despite John Schlesinger casting him as an outwardly gay man in the 60s film Darling to convince him of his true leanings! The granddaddy of forgotten sitcoms, 'Colin's Sandwich', has so far escaped even this blog's attentions. Probably worth an entry on its own. Also worth mentioning that Mel Brooks' 'The Nutt House' was a hit here in Britain, but flopped in its native land. Can we claim such shows as "Curious British Telly" via adoption? Some good suggestions there, Kisbie. Already looked into a few of them and they've had DVD releases, so they're not quite obscure enough. I'm trying to really go off the beaten track with these! What about Channel 4's 'The Corner House'? Last glimpsed on the 'Red Dwarf' episode of 'Comedy Connections'. "A sitcom with no com, and not very interesting sit," said one of its own stars. The Corner House is completely new on me, so that's another one for the list. Kisbie, I just rewatched Colin's Sandwich all over again. Never tire of it and try to revisit it every couple of years. Sublime writing and performing and you're right, it's sadly overlooked now. Whites is in the process of being remade for US TV. I wonder if the BBC will end up buying their version, just like they did with Dear John? 'Colin's Sandwich' is the best thing Mel Smith ever did, and that's not something to be said lightly. Yet it was completely absent from the BBC's tribute documentary in 2013. Once Upon a Time in the North by Tim Firth. Beautiful, funny comedy that criminally lasted just one series in the mid 90s. +1 for the late, great Colin's Sandwich. Langley Book of Horror, anyone?